This design is free from the Rowan website. 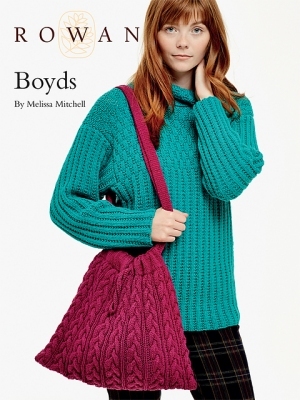 : "This slouchy bag features an all over cable design and stocking stitch strap." This design is free from the Rowan website. Remember to download or print the pattern by following the link provided on this page, as it will not be shipped with the yarn. A free Rowan account is needed to download this pattern from the Rowan Website. It just takes a moment to create your account on their site before you view and download your pattern. Size US 7 straight needles, US 6 straight needles, a cable needle, one large button, fabric for lining, and a sewing needle and thread are required but not included. Gauge: 29.5 sts and 26 rows over 4"